← ERROR: The column cannot be deleted because it is currently part of a composite column index. The Boston Area SharePoint Users Group, SharePoint Saturday Boston, and The SharePoint Technology Conference Boston. We have a lot of SharePoint around here. And just when you think that there cannot possibly be any more local SharePoint events… think again. 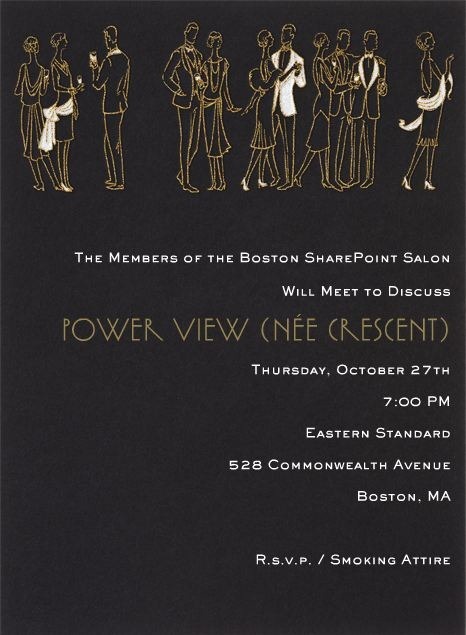 Next Thursday, October 27th, the 3rd meeting of the Boston SharePoint Salon will be taking place at Eastern Standard in Boston. We’re a small group of SharePoint professionals, to get together with a topic, and just talk. No presenters, no sponsors – just a SharePoint get together with food and drink. Interested in going? Go here for more information… I’m just spreading the word.